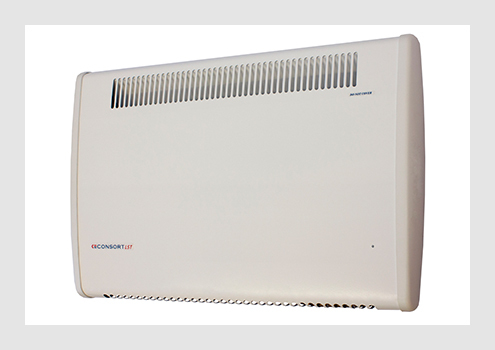 Ideal for Nurseries, Care Homes, Hospitals & Accommodation where vulnerable people are present, the EH 0.9 kW, 7050 & 7070, 1.5 kW, 7100 and 2.0 kW 7110, 7130 Premium LST Radiators use the heated and circulated water design of the familiar domestic water filled radiator to provide superior low surface temperature heating comfort and safety. Excellent heating quality, with no exposed to air heating elements, so no scorched or over dried air. Ti Versions – Simple manual 24 hour On / Off segment time control, and manual thermostat. For non standard heating zones that are used infrequently, such as meeting rooms and community areas, the optional EHCZC2 wireless touchstat (same price) can be specified to control the heaters instead of the Programmable Digital Control Panel. The alternative EHCZC2, when touched, brings the room temperature to a higher pre set temperature for a pre determined length of time. At the end of the time period the controller resumes the lower preset temperature. If you require the EHCZC2 option please contact us. RFC wireless radiators are used together with the battery operated wireless RFC Digital Programmer. Each RFC radiator, or 'a group of radiators' can be controlled together by one RFC Controller for the same temperature and timings.